Could I be Damaging My Ear? Several years ago I noticed a rapid decrease in my ability to hear from my right ear. I resigned myself to partial deafness and wondered how this handicap would impact my life. Then I went to the doctor and, after a brief irrigation (spraying water into my ear), I could hear normally again. I almost felt a miracle had been performed! Actually no miracle was involved at all. Instead my earwax had built up and clogged the auditory canal. When it was removed, sound could once again get to my eardrum. But earwax is not a nuisance. It is a gift from God. 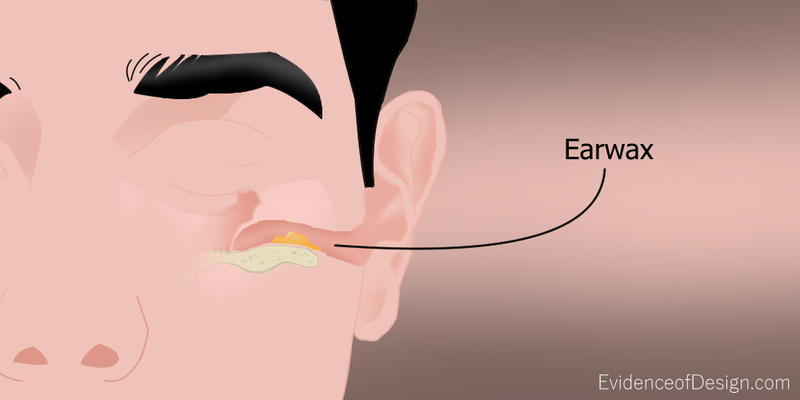 Earwax, or cerumen, is formed in the outer third of the ear canal. It has several purposes. First, it is an agent of cleaning the ear canal. Assisted by chewing and jaw motion, old earwax is constantly being transported from the ear canal to the ear opening where it usually dries, flakes, is washed out, and falls out. The wax is not like candle wax. It is instead a filamentous wax and this gives it a high electrostatic charge. This charge attracts the dust and dirt that gets into the auditory canal. The skin in this canal is unusual in that it grows sideways. This aids in this conveyer-belt-like movement of the wax and dirt out of the ear. Earwax also acts as an insect repellant. Something about it is repulsive to insects and this keeps them out of that protective cavity. Earwax also lubricates the ear canal so that it stays flexible. This is important for it does flex when we grin, or move our jaw or head in certain ways. Cerumen also has anti-bacterial properties, meaning, it helps keep infection out of the ear. When infection occurs, extra earwax is produced and this may be a cause of ear canal plugging such as I experienced. Since earwax is produced in the other third of the ear canal and moves outward, it is important we don’t force it deeper into the ear, especially with sharp objects that might damage the eardrum. God placed the delicate organs of the ear deep within the skull for a reason. Our smallest finger is still too large to reach into its ¼ inch diameter or one inch length to damage the eardrum. Earwax is an illustration of one of the thousands of little details that make the body perfectly adapted and functioning in its environment. Even if someone could prove that one of these minute details developed by accident, the sheer weight of examples just in the human body shouts that random accidents cannot explain their existence. To believe otherwise is not being honest to the facts. Just because you happen to find something ‘easier to accept’ does not make it more likely to be true. Real scientists deliberately go to great lengths to design experiments that eliminate the observers expectations, hopes and personal experiences.